I thought it was a good time for a random post and music news update. The National have announced a show at the Roxy on October 6th in support of their stunning 4th release Boxer. I have not had the opportunity to bear witness to their live show but I'm already working on convincing Mrs. Speakers to join me for this one. This is more rumor at this point and should be treated as such until the crack staff at The AGP can get full confirmation. Robert Pollard will play a few shows in late November and December. The cities that I've heard mentioned include Chicago and Newport, KY. Until I hear that it won't happen I will keep hope that we will see a show in New England before long. If not I'll just have to pack my bags and hit the road. As you may remember Pollard announced that he would be taking a break from playing Live at the end of the Normal Happiness Tour. So pack his cooler he's hitting the stage again. Just to remind us when a band breaks up it may not be for very long. 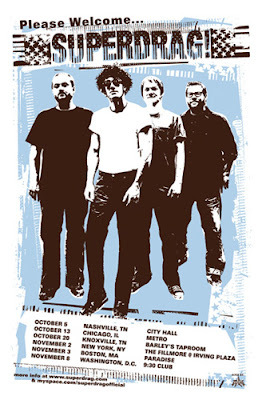 Knoxville's favorite sons Superdrag have reconvened for a reunion tour that will consist of six shows kicking of Nashville on October 5th. The Drag will play the Paradise in Boston on November 3rd.